The Yellow Water Cruise is are one of the most Iconic tours in Australia and is a highlight of most peoples Kakadu Itinerary! It such a special experience it is even worth splurging if you’re a budget traveller! The reason why Yellow Water Cruises are so unique is because you get the chance to cruise world heritage listed wetlands and river systems with knowledgeable guides. They will teach you about the park and its wildlife and you will likely see birds and animals quite close to the boat. The later you visit in the dry season (approximately mid May – October) the more abundant the wildlife can be as the billabongs become a refuges for animals looking for water. For this reason the dry season is the most popular and recommended time to visit. However if you can’t visit in the dry season, the bonus of visiting Kakadu in the wet season is there is a lot more water. This means the tours can sometimes take you further into places that are not accessible in the dry. You will see the Yellow Water Billabong in a way very few tourists do, when water is abundant, the flood plains are full and vegetation is lush. The cruise visits the Yellow Water Billabong and the South Alligator River, both beautiful and unique ecosystems to see. As an added bonus this area of Kakadu has lots of wildlife and you will have the chance to spot many bird species and usually crocodiles as well (crocodiles are spotted on most cruises but they are not guaranteed). There are usually 6 cruises a day in the dry season and 4 cruises a day in the wet season, including sunrise and sunset and then 2-4 in between this. Which Yellow Water Cruise should you do? The 2 hour sunrise and sunset cruises are the most popular as wildlife is generally more active at this time, particularly in the warmer months. You will also have the opportunity to get beautiful landscape photos in the soft afternoon or morning light. If you have small children who will get restless, have a tight schedule or are on a day trip you may prefer to do the shorter 1.5 hour cruises in the middle of the day. If you would prefer to stay in in Jabiru instead of at nearby Cooinda this will also be a good option as you generally can’t drive rental cars in the dark. Through your agent or jump onto the Kakadu Tourism website and book it in now! In the dry season and in school holidays and long weekends it is a good idea to pre-book your cruises, especially sunrise and sunset as they regularly book out days in advance. Can’t decide which cruise to do? Love wildlife and birds? 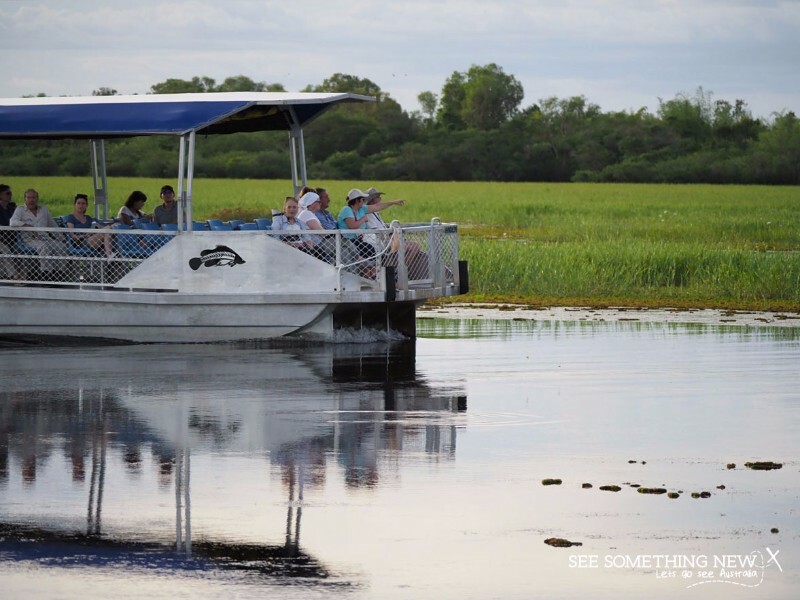 Take advantage of the Kakadu Tourism ‘Cruise Again’ special, where you can get a second cruise for around $25, this means you don’t have to try and choose between sunrise and sunset. When you book online it gives you the chance to add on the second cruise..
Yellow Water Cruise is highly rated on trip advisor and at the time this article was published it was number 1 for tours in Kakadu, has a certificate of excellence and is rated 4.5/5 stars by trip advisor travellers. The Yellow Water Cruise is a See Something New favourite. It is an iconic cruise in Australia and is a much loved holiday memory for many visitors to Kakadu National Park. The Yellow Water Cruises leave from the Cooinda Road off Kakadu Hwy. During the dry season you will turn right off the Cooinda Road before you get to the lodge. In the wet season the cruise may sometimes leave from Cooinda (also where bookings are made) so if the gates are closed proceed to the lodge. Sadly these tours are not a true wheelchair accessible activity in the sense that they don’t have a big wide flat ramp onto the boat or the ability to strap in wheelchairs. However they do have a ramp all the way to the boats and a narrow arched ramp onto the boat and some people find that can fit a very slimline hire type scooters or chairs on the ramp but you must then be able to transfer to a seat. Call Kakadu Tourism directly for further information. I am a passionate advocate of Australian Travel and I love everything from bushwalking, camping and four wheel driving to luxury hotels, gourmet vegetarian meals and nice wineries. But most of all I just love beautiful outdoor destinations. And its all in our backyard! So go on, get out there and see Australia- you might just fall in love! My Top 5. The Kimberley. Outback Australia. The Great Ocean Road. Tasmania's National Parks. The Great Barrier Reef.